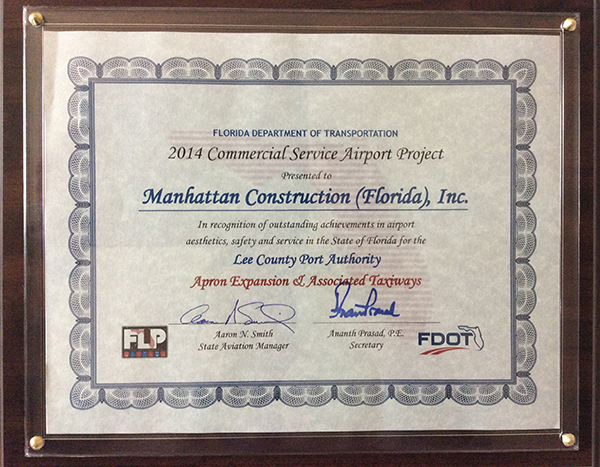 FORT MYERS, FLA. – The Florida Department of Transportation (FDOT) has honored Manhattan Construction, Lee County Port Authority, and AECOM Technology Corp. with the 2014 Commercial Service Airport Project award for construction of the Apron Expansion & Associated Taxiways project at Southwest Florida International Airport in Fort Myers, Fla. This honor is bestowed to organizations that demonstrate exceptional professional skills and represent a significant contribution to airport development, sustainability, efficiency, capacity, and/or safety and be a project funded under the FDOT Aviation Grants Program. A few of the evaluation factors included overcoming challenges, resourcefulness in planning and displaying cost-effectiveness. Manhattan Construction was the general contractor for the $28 million project which included construction of five new taxiways, expansion of the existing apron and restoration of the existing storm water detention pond slopes. 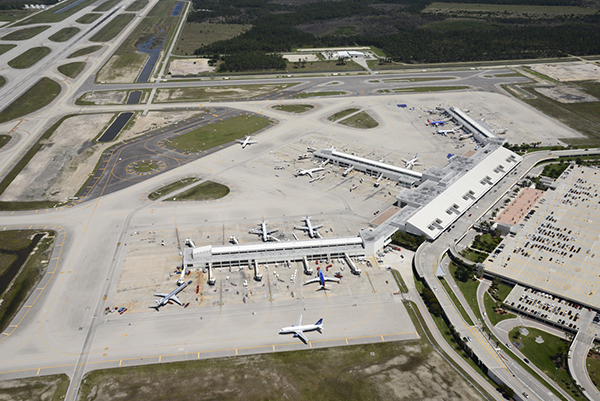 The Lee County Port Authority is the owner of the project and AECOM was the project engineer. You are currently browsing the Manhattan Construction Group blog archives for August, 2014.